GUILDERLAND — Edgar Dickinson, 84, of Guilderland passed away peacefully Wednesday, Dec. 12, 2018 at his home. Born on Aug. 5, 1934 in Northumberland, Edgar was the son of the late Albert and Amelia ( Bahr ) Dickinson. He was the devoted husband to Joan M. (Bacon) Dickinson for 19 years. After relocating to Guilderland, Edgar became a lifelong resident. Edgar was a graduate of Fort Edward High School. He served an apprenticeship with Bendix Corporation as a machinist. He was employed at NL Industries in Colonie as a lead machinist and foreman and was a Self-Employed machine shop owner, which he co-founded D&E Industries Inc. in Rotterdam. After retiring from his own machine shop, D&E Industries Inc., he worked at CBM Fabrications in Ballston Lake as a machinist, which he considered more of a hobby working with his friends and colleagues. Edgar was a proud member of Guilderland Elks Lodge Post No. 2480, where he was a devoted volunteer holding multiple positions and organizing events and picnics. 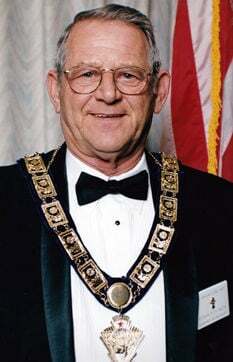 Edgar served as past Exalted Ruler and was a current trustee. He was also a member of the Society of Manufacturing Engineers (SME). In addition to the Elks, Edgar belonged to and volunteered time with the Good Sam Club. Edgar’s hobbies and interests included; camping, traveling, fishing, hunting, skiing, snowmobiling and enjoying the company of friends and family. Every year, Edgar and a special group of friends enjoyed a big fishing trip to Canada for 2 weeks. Loving husband of Joan M. (Bacon) Dickinson whom he married Aug. 15, 1999; dear father of, Michael Dickinson (Gloria) the late Michelle de la Rosa (Juan), Mike Jackson (Alida) Scott Jackson (Carrie) the late Ronnie Bacon (Tina) Debbie Leonard, Jeff Bacon (Judy), Genie Mayo, Lisa Lee (Jason) Cherished grandfather of; Allison de la Rosa, Alexa, Maria and Sophia Jackson, Jeremy, Amanda, Tracy, Emily, Jeffrey and Olivia Bacon, Robert, Michelle and Nicole Leonard, Ashley, Chelsea and Lindsay Mayo, Maci, Megan and Julia Lee; 3 great-grandchildren; and several nephews, nieces, cousins, also survive. His best canine friend, Ginger was always at his side. Besides his parents and his daughter, Edgar was predeceased by his wife, Jean A. Jackson, who passed away in July 1997 and son in law, Jeffery Mayo, who passed away in May 2013. He was also predeceased by his two brothers: Robert and Clayton Dickinson. A special thank you to Debbie Betz, Dad’s dear friend and caregiver. Relatives and friends may call from 4 to 7 p.m. Tuesday, Dec. 18, at New Comer Cremations & Funerals, 343 New Karner Road, Colonie. Funeral Services will be held at 10 a.m. Wednesday, Dec. 19, from the funeral home thence to St. Joseph’s Cemetery in Schenectady for the interment. To leave a special message for the family online, please visit: www.NewComerAlbany.com.